The phrase “feminist infighting” is by now so smoothed-down through overuse that it is almost like a single word itself. Plenty of brilliant writers have written about how infighting destroyed feminism’s powerful second wave in the 70s, including Nora Ephron in her painful and funny essay Miami about the fight between Betty Friedan and Gloria Steinem, and, at the more radical end of the spectrum, Susan Faludi’s beautiful essay about Shulamith Firestone, published in the New Yorker last year. The question is whether feminism is trapped in its own Groundhog Day (RIP Harold Ramis) and undoing itself again in its fourth wave. Judging from much of the recent coverage of modern feminism, the answer does seem to be yes. In a recent article in the Spectator, Julie Burchill, with her characteristic bluntness and dismayingly characteristic transphobia, denounced intersectionality – a major tenet of fourth-wave feminism – after her brief experience with it on Twitter last year, describing it as a “hissy-fitting hothouse”. In the US, Michelle Goldberg recently wrote in the Nation about Feminism’s Toxic Twitter Wars, detailing how bitter online battles among feminists scuppered various initiatives, and descended into bullying and – to use a term coined by second wave feminist Jo Freeman about precisely this problem – “trashing”. “If there’s something inherent about the way women work within movements that makes us assholes to each other, that’s very sad,” feminist activist Courtney Martin said to Goldberg. That would be very sad. 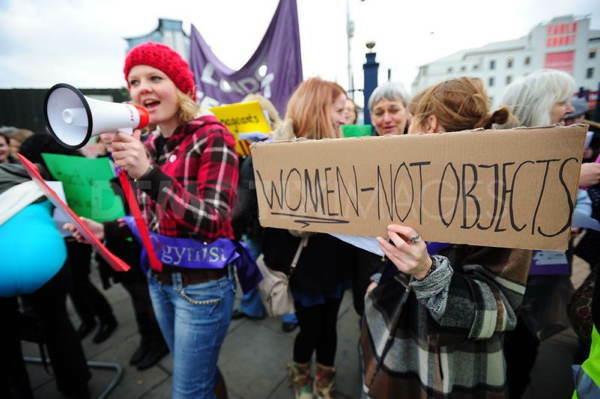 It is also, I firmly believe, not true – what would be the point in fighting for feminism otherwise? – but this is exactly why talking about feminist infighting is so difficult: it makes women sound like the bitchy babies that sexists have always suggested we are, incapable of being given any position of authority without throwing tampons at one another, and therefore best left in the kitchen. But, as anyone who writes about feminism now knows, there is no criticism more virulent than the criticism that comes from your own side, online. In many ways, the web has been great for feminism – just imagine how much easier it would have been for the National Organisation of Women in the 60s, let alone the suffragettes, to get organised if they’d had the web. It has also been a great learning device for me, personally. When I started writing about feminism, I had a vague (admittedly, very vague) awareness that the needs of black women and poor women differed from my own, thanks to writers such as bell hooks, Alice Walker and Barbara Ehrenreich, and that’s still an ongoing learning process for me. But I had no awareness – none – of issues facing trans women or disabled women. Online critics were, with occasionally more sarcasm than patience, quick to awaken me to the gaps in my knowledge, and that was a good thing. But the internet, for whatever reason, is to hysteria what damp rooms are to mould. Cries of privilege-checking and intersectionality – both, objectively, good things – too often become tic-like terms of abuse and a means of shutting down conversation as opposed to opening it up. They have become feminism’s version of Godwin’s Law. Tellingly, it is feminist writers and editors who work for leftwing publications who attract the bitterest abuse on social media from fellow feminists, as opposed to the sexists and misogynists on rightwing publications. This is because the flaws or even failures of those nearby are so much more egregious than those far away. Critiquing and educating is one thing, publicly slamming leftwing feminist writers as “low-level media whores”, as one prominent blogger did this weekend, is, I think we can all agree, another. But here’s the thing: the web – and Twitter especially – is not the whole of feminism. It’s easy to forget that fact, because journalists who write about feminism, such as myself, spend too much time on the web (and on Twitter) and therefore have a tendency to focus too much on it. Feminism is doing just fine, in its stumbling, fallible way, and one of its strengths is that it is making real efforts to include women who were overlooked by its earlier incarnations. To reduce feminism to the screaming fights among the few as opposed to the actions of the brave is to do the work of the other side – the real other side – for them. It is not infighting that is destroying feminism, it is because men and women have woken up to the terrible destruction feminist dealogues have caused for 40 years. They have been doing this for 40 years unopposed but now men and women are pushing this hateful ideaology back to the dustbin of history where it belongs. Men have kept women alive for nearly all of human history, and still do in most of the world. This is done at great risk to men. But within 40 years a few bigotted females have caused great harm to men and children. Feminism has become nothing but a violent hate movement based on nothing but hatred of men and boys. It is all possible only because of big government that is all paid for by 72% male taxes. They have nothing but emotional argument based on shaming, blaming, victimhood, hate, personal attacks “man up anyone? “. They cherry pick their “inequalities” , of course, it is a power grab of a few shouty females with little talent. Dear Martin. What needs to stop is the hatred. On all sides. It’s time we start loving all our brothers and sisters. Yes many many men are very angry indeed, this is a normal emotion after a group of bigots have been allowed to influence the law so strongly and take away basic human rights from men. You are confusing the anger of men, who have been denied the right to be part of a nuclear family for example, and feminists who are just full of hate for half the population. The half who have built the wirld and kept women alive since the start of human existence. I think someone has missed out a few facts, such as the brilliant observations of Dr Christina Hoff Sommers in her book “Who Stole Feminism” 1994. Infighting is one thing but so many have just taken a gun, pointed it at the ground and blown their own feet off – very publicly. Take Naomi Wolf claiming the feminist issue of Anorexia and then claiming that 150000 American women die per year from Anorexia. The Beauty Myth, pp. 182 (Corrected in reprints after 1994 because Dr Hoff Sommers Embarrassed the supposed historian who could not read history and check basic facts). IT’s totally false and spurious. Wolf loved the big numbers but had no rational or common sense head for maths – and the correct figure was between 10 and 100 as confirmed by The Centre for Disease Control Atlanta (CDC). Steinem was no better and she also made the same claim in her supposed Opus “Revolution from Within: A Book of Self-Esteem” (1992), page 222 … and she was also corrected by Hoff Sommers. The Woozles created by these entitled feminist fiction writers. But the most amazing thing is that Steinem has so little interest in reality over propaganda that she reprinted and reissued the error in 2012. Now I know she is getting on in years, but it still takes an amazing level of arrogance to be publicly corrected over such a ridiculous error, and then 20 years later juts reprint it as if it never occurred. On the other hand, it may not be arrogance, just delusion which is being clarified over time. So many like Steinem and Wolf haven’t had a leg to stand on since the blew their own feet off over 20 years ago. Infighting is not the major issue, but idiocy and caught out propaganda is.